Here are the pieces from Monday, July 4 - Sunday, July 10. What you see above is Day 10. I used my compass to create the "seed of life" drawing which I've done before. 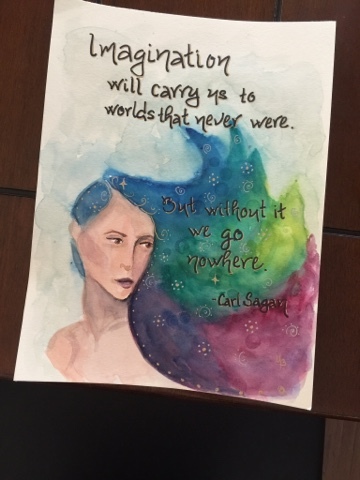 This time, however, I used watercolors to to color the negative space. This ended up being more of a color study than a completed piece. 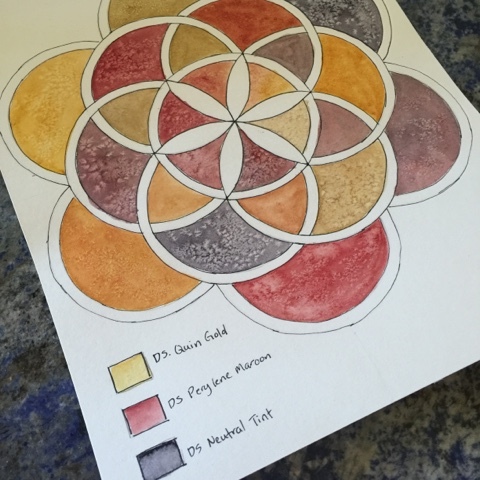 I used three colors from Daniel Smith - Quinacridone Gold, Perylene Maroon and Neutral Tint. Using two colors at a time, I created several colors. Plus I added salt while the paint was wet to create the texture. I may use this again for othe tri-color combos. 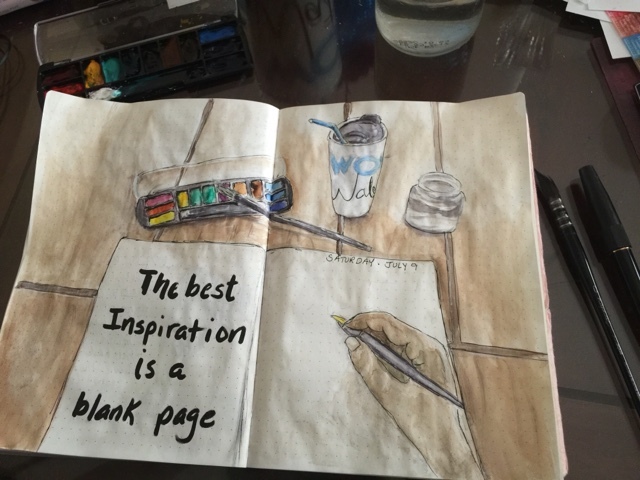 Sometimes when I'm stuck for an idea, I just draw myself drawing in my journal. It's a good practice to draw the hand. I'm disappointed in how light the hand is.. I always forget watercolors dry so much lighter. Many things in nature follow a spiral pattern, petals in a flower, how leaves arrange themselves, pineapple rind, etc. There is a special sequence called Fibonacci numbers that appear quite a bit in nature. The sequence is simple, you start with 1 and and you add the previous.. So the sequence goes 1, 1, 2, 3, 5, 8, 13, 21, 34, etc. These numbers appear in nature. For example, the number of petals in a flower is one of the Fibonacci numbers. If you divide the two consecutive Fibonacci numbers, the quotient approaches 1.618 as you go higher in the sequence. That number is called the golden ratio. There is a relationship between the golden ratio and how petals are arranged. Ok, enough math. So I used my math knowledge to create the flower above. Pretty needy but so cool..
My new favorite color is Neutral Tint by Daniel Smith. It's a wonderful grey/black on its own and it's great with mixes with other colors. 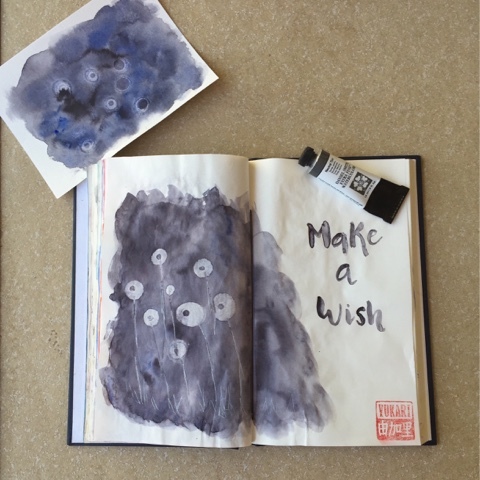 So I used neutral tint in my journal and dropped tiny alcohol drops. Alcohol repels water and moves the color out to produce this light puff. 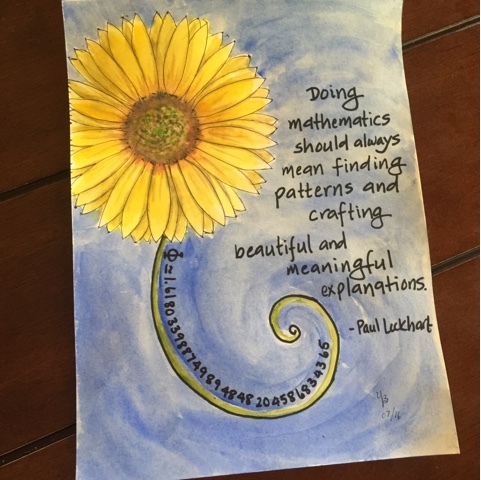 Here is another math related art. This is a tessellation art. Tessellation is just repeated patterns. You can slide, rotate or do a combination of both. I created a pattern out of a triangle and created a rotational tessellation art. The cool thing is trying to "see" what the pattern shows. I saw a bird, a butterfly, and a fish and decided to go with birds and butterflies. I should have gone with the fish. But I'm happy with the results. I decided to go with analogous colors (next to each other on the color wheel) for each. 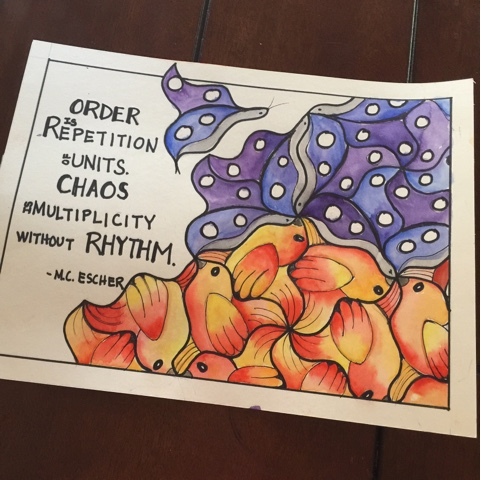 And I used a quote by MC Escher, who is know for his amazing mind-bending tessellation and optical illusions. Ok, the only watercolors you see are on the small piece of art.. I made that for a Facebook friend who is not doing well physically. 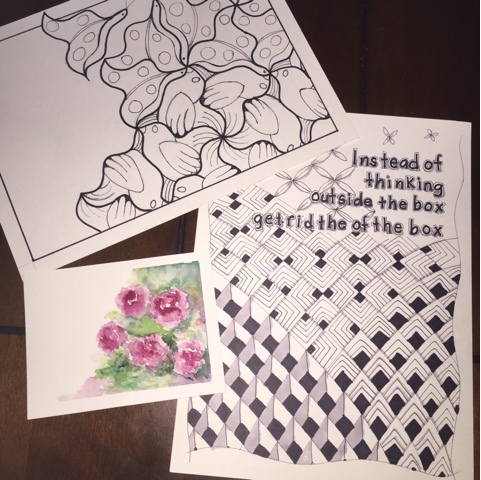 But I also created that cool zentangle piece. I love transforming one pattern into something else. I actually worked on two pieces because I got up at 3:30 am and couldn't go back to sleep. So I fished one piece and started another. I love both quotes. The bamboo fountain piece was done in a realistic method so it took awhile it to complete. I used to love to watch these bamboo fountains as they fill and and empty. The second one was done without a pencil or pen for pre-drawing. 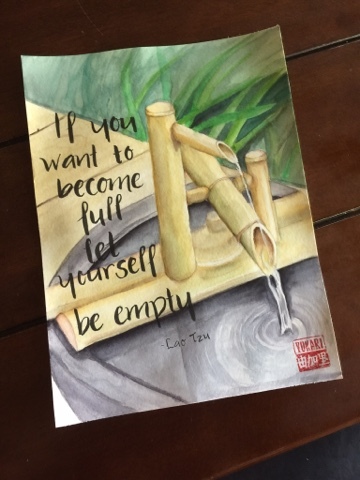 All was done with watercolors. I was happy with the result.. So this concludes the second week. There are over 3000 artists that are part of this group on Facebook and it's amazing the talent! 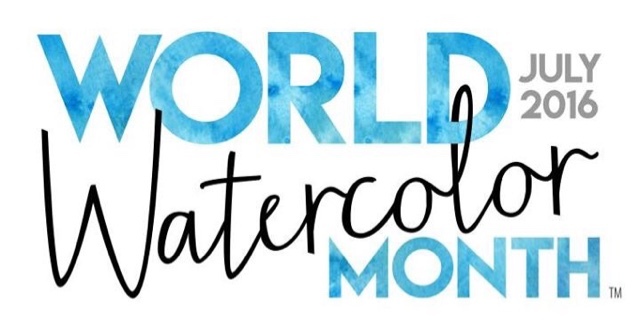 Check out the hashtag #worldwatercolormonth on various social media for pieces submitted! 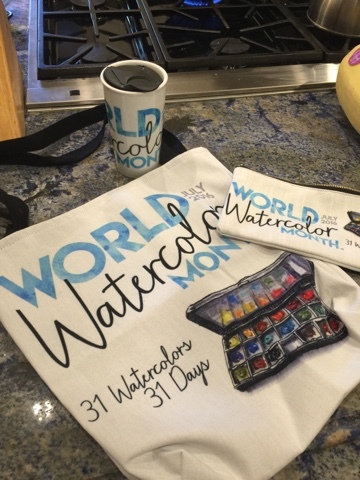 Check out the website to order merchandise that benefit the Dreaming Zebra Foundation to provide art supplies for underprivileged children. I agree with triple li, Angelcake. They are all indeed beautiful. My little dusty mind cannot put math and art together since I'm lousy at both :) Happy to see you creating again.